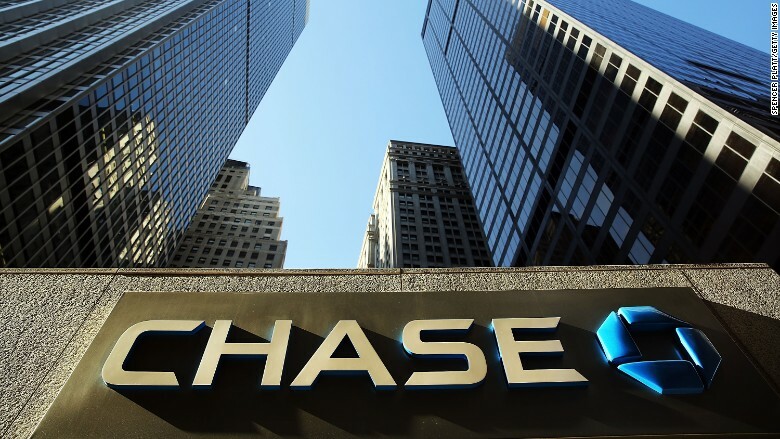 JPMorgan Chase got hit by a double whammy last quarter: the Federal Reserve kept interest rates low and chaos hit the financial markets. That one-two punch caused JPMorgan (JPM) to suffered a 6% decline in revenue, the bank reported Tuesday. The slump was driven in part by the extreme turbulence that rocked Wall Street late in the summer, as highlighted by the 1,000-point Dow plunge the morning of August 24. JPMorgan still made money -- $4.3 billion in revenue -- off the market, but that was 6% less than it made the prior year. "That's going to happen in markets like that," JPMorgan CEO Jamie Dimon told reporters during a conference call. Dimon said JPMorgan is "pretty pleased" with how the bank navigated the "very volatile markets." Last quarter was the worst for the stock market since 2011. Financial markets broadly were rattled by a combination of China's economic slowdown and uncertainty over when the Federal Reserve would hike interest rates. Those forces spilled over into emerging markets, especially in Brazil. JPMorgan said that while its equity markets revenue rose last quarter, bond markets revenue tumbled 11% from a year earlier. The good news is that Marianne Lake, JPMorgan's chief financial officer, told reporters that "markets are reasonably quiet" in recent weeks. Wall Street didn't like JPMorgan's latest numbers, driving its shares 1% lower in after-hours trading. Like other banks, JPMorgan continues to be hurt by near-zero interest rates. Extremely low rates makes it more difficult for banks to make a profit on the difference between paying out interest to depositors and charging interest on loans. But Lake said JPMorgan isn't obsessing over the timing of a Fed rate hike. "We don't get overly focused on exactly when or how much rates will rise by...We're running our company for the long term," Lake said. While credit conditions to improve around the country, pain is being felt in the energy industry because of extremely low oil prices. JPMorgan said it set aside more money to cover potential losses from troubled oil and gas loans. The move reflects "the market sentiment that oil prices will remain low for longer," Lake said. "We still feel great about the business and our exposure," Lake said. JPMorgan also said it does have exposure to Glencore (GLCNF), the mining and trading giant that in late September was forced to deny talk it's on the brink of collapse. Glencore shares have since rebounded.